There are two main components in HTML-Based Application Architecture. Business Components for Java(BC4J) is included in Oracle JDeveloper. It is used to create Java components that represent business logic. AOL/J supplies the Oracle Applications Framework with the underlying security. It gives OAF its database connection-specific functionality. The hyperlink is clicked by the user with the help of web browser from the client desktop. With the help of web listener, the browser connects from the URL. 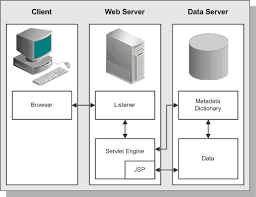 The JSP, in turn, connects the servlet engine(Jserv) and it runs a Java Server Page(JSP). The JSP, in turn, connects the Oracle database, gets information from the metadata dictionary and the content from the application tables in order to construct the HTML page.